Adding warm anything to a salad, in this case flank steak to greens and herbs, softens up the greens and blend the flavors. This is pretty, easy and can be done mostly in advance. Feel free to skip the garlic chips altogether if you like. Pat the flank steak dry with paper towels. Rub the salt and red pepper into the beef and place it in a large resealable plastic bag. Scatter half the onions and half the garlic over the beef and pour in half the lime juice. Seal the bag and shake it to distribute all the marinade ingredients evenly. Refrigerate 1 to 2 days, turning the bag several times. Trim any wilted or discolored leaves or leaf tips from the romaine. Cut the head in half lengthwise, then cut out the core. Cut the lettuce into bite-size pieces. Cut away and discard any watercress stems thicker than a strand of spaghetti and any wilted or yellow leaves. Pick off as many (or few) of the mint and cilantro leaves as you’d like to use in the salad. Wash all the greens in plenty of cool water, drain them and spin them dry in a salad spinner. The greens can be prepared up to one day in advance. Store them in a plastic bag in the crisper drawer. Up to a few hours before serving, make the garlic chips and the dressing: Heat the olive oil in a small skillet over medium-low heat. Scatter the remaining sliced garlic over the oil and cook, shaking the pan occasionally, until the garlic chips are pale golden brown. Remove them immediately with a slotted spoon, letting as much oil as possible drip back into the skillet. Drain the chips on paper towels. Cool the oil. Pour the oil, remaining lime juice, Thai fish sauce, sugar and jalapeno into a small jar with a tight fitting lid. Shake vigorously. Taste and adjust the seasoning as you like. About 30 minutes before serving, grill, broil or pan-fry the flank steak to medium-rare. While the steak is cooking, fluff the romaine, watercress and herb leaves in a bowl. Scatter the cherry tomatoes and remaining red onion over the salad. When the steak is done, let it rest 5 minutes before carving. 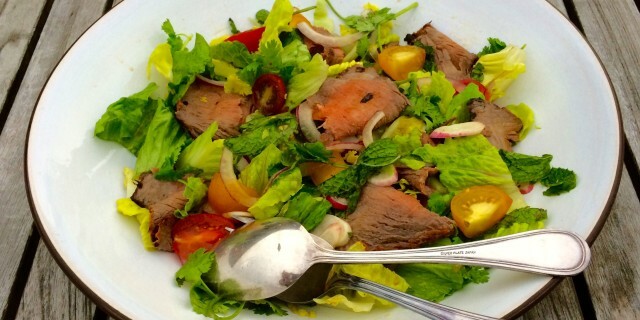 While the steak is resting, pour the dressing over the salad and toss it well. Cut the flank steak on the bias and against the grain into very thin slices. Add as many slices to the salad as you like, toss well and scatter the garlic chips, if using, over everything. Serve immediately. © 2015 Christopher Styler – Freelance Food, LLC.